I have a definite soft spot in my heart for sweet potatoes. Regular potatoes are okay, I like cooking with them, but sweet potatoes are delicious. Growing up we only had sweet potatoes once a year and they were usually covered with marshmallows. It wasn't until I was an adult that I started experimenting with using sweet potatoes in stews and recipes. Now I normally eat them about twice a month. My two boys have fallen in love with sweet potatoes fries, but every recipe I have tried has been soggy and lacking in flavor. The November issue of Woman's Day Magazine had a recipe for Sweet and Spicy Roasted Sweet Potatoes that combined the flavors of cinnamon, cayenne, brown sugar and Parmesan cheese and looked delicious. This recipe has 8 ingredients. It takes a total time of 1 hour and 15 minutes, 15 minutes of which is active, and makes 8 servings. All the ingredients are basic and I already had in my pantry cupboard or were readily available at my local grocery store. Tossing the sweet potatoes in a bowl with the ingredients made for nicely coated and even potatoes. I ended up only using one very large baking sheet since my disco era oven can only barely fit one pan. Make sure to stir the sweet potatoes to prevent burning, I stirred mine multiple times during the 60 minute cooking time. I followed the remainder of the recipe as written. I loved how this recipe turned out crispy and delicious. Many sweet potato recipes I have tried in the past have ended up soggy or lacking a distinguishable flavor. I was impressed with how nicely coated and crisp these sweet potatoes were. My two boys loved this recipe and ate over half the dish by themselves. The recipe states that it makes 8 servings, but I found that this was a very large recipe. It could easily be cut in half for a family of four. Overall, a great sweet potato recipe that is full of flavor. For the recipe go to Sweet and Spicy Roasted Sweet Potatoes. Ooh! This looks and sounds amazing! your boys are lucky to be exposed to all of this different food. I really love sweet potatoes too but we don't buy them because BF doesn't like them. I only get them for the holidays. Love this - I will have to try since I usually get soggy potatoes too no matter what recipe I try. We love roasted sweet potatoes, don't like them mashed. I'm obsessed with sweet potatoes. I eat them twice a week. @Renee It was pretty yummy! @momto8 Thanks :) They are pretty good about eating most foods that I give them. @martinelli Thanks :) They really were delicious! @E I've tried many recipes that have given me soggy sweet potatoes also, it is very frustrating! @The Blonde Duck I'm pretty obsessed with them also, plus they are loaded with vitamins! Sweet potato anything is delicious!! This recipe looks like another on my to try list this week!! thanks! 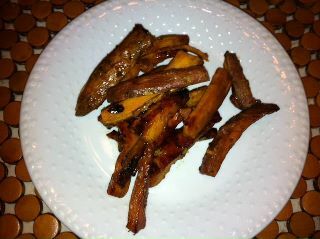 @Jean I agree, sweet potatoes are delicious :) Hope you like the recipe if you try it! I need to try this. It sounds so good. I wonder if moroccan spices would be nice on this one. Going to check out the recipe now.